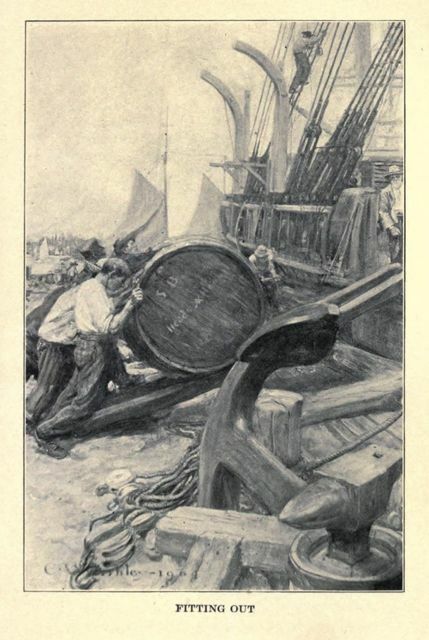 Now having a night, a day, and still another night following before me in New Bedford, ere could embark for my destined port, it became a matter of concernment where I was to eat and sleep meanwhile. It was a very dubious-looking, nay, a very dark and dismal night, bitingly cold and cheerless. I knew no one in the place. With anxious grapnels I had sounded my pocket, and only brought up a few pieces of silver,- So, wherever you go, Ishmael, said I to myself, as I stood in the middle of a dreary street shouldering my bag, and comparing the towards the north with the darkness towards the south- wherever in your wisdom you may conclude to lodge for the night, my dear Ishmael, be sure to inquire the price, and don't be too particular. With halting steps I paced the streets, and passed the sign of "The Crossed Harpoons"- but it looked too expensive and jolly there. Further on, from the bright red windows of the "Sword-Fish Inn," there came such fervent rays, that it seemed to have melted the packed snow and ice from before the house, for everywhere else the congealed frost lay ten inches thick in a hard, asphaltic pavement,- rather weary for me, when I struck my foot against the flinty projections, because from hard, remorseless service the soles of my boots were in a most miserable plight. Too expensive and jolly, again thought I, pausing one moment to watch the broad glare in the street, and hear the sounds of the tinkling glasses within. But go on, Ishmael, said I at last; don't you hear? get away from before the door; your patched boots are stopping the way. So on I went. I now by instinct followed the streets that took me waterward, for there, doubtless, were the cheapest, if not the cheeriest inns. Such dreary streets! blocks of blackness, not houses, on either hand, and here and there a candle, like a candle moving about in a tomb. At this hour of the night, of the last day of the week, that quarter of the town proved all but deserted. But presently I came to a smoky light proceeding from a low, wide building, the door of which stood invitingly open. It had a careless look, as if it were meant for the uses of the public; so, entering, the first thing I did was to stumble over an ash-box in the porch. Ha! thought I, ha, as the flying particles almost choked me, are these ashes from that destroyed city, Gomorrah? But "The Crossed Harpoons," and the "The Sword-Fish? "- this, then must needs be the sign of "The Trap." However, I picked myself up and hearing a loud voice within, pushed on and opened a second, interior door. Moving on, I at last came to a dim sort of light not far from the docks, and heard a forlorn creaking in the air; and looking up, saw a swinging sign over the door with a white painting upon it, faintly representing tall straight jet of misty spray, and these words underneath- "The Spouter Inn:- Peter Coffin." Coffin?- Spouter?- Rather ominous in that particular connexion, thought I. But it is a common name in Nantucket, they say, and I suppose this Peter here is an emigrant from there. As the light looked so dim, and the place, for the time, looked quiet enough, and the dilapidated little wooden house itself looked as if it might have been carted here from the ruins of some burnt district, and as the swinging sign had a poverty-stricken sort of creak to it, I thought that here was the very spot for cheap lodgings, and the best of pea coffee. It was a queer sort of place- a gable-ended old house, one side palsied as it were, and leaning over sadly. It stood on a sharp bleak corner, where that tempestuous wind Euroclydon kept up a worse howling than ever it did about poor Paul's tossed craft. Euroclydon, nevertheless, is a mighty pleasant zephyr to any one in-doors, with his feet on the hob quietly toasting for bed. "In of that tempestuous wind called Euroclydon," says an old writer- of whose works I possess the only copy extant- "it maketh a marvellous difference, whether thou lookest out at it from a glass window where the frost is all on the outside, or whether thou observest it from that sashless window, where the frost is on both sides, and of which the wight Death is the only glazier." True enough, thought I, as this passage occurred to my mind- old black-letter, thou reasonest well. Yes, these eyes are windows, and this body of mine is the house. What a pity they didn't stop up the chinks and the crannies though, and thrust in a little lint here and there. But it's too late to make any improvements now. The universe is finished; the copestone is on, and the chips were carted off a million years ago. Poor Lazarus there, chattering his teeth against the curbstone for his pillow, and shaking off his tatters with his shiverings, he might plug up both ears with rags, and put a corn-cob into his mouth, and yet that would not keep out the tempestuous Euroclydon. Euroclydon! says old Dives, in his red silken wrapper- (he had a redder one afterwards) pooh, pooh! What a fine frosty night; how Orion glitters; what northern lights! Let them talk of their oriental summer climes of everlasting conservatories; give me the privilege of making my own summer with my own coals. But no more of this blubbering now, we are going a-whaling, and there is plenty of that yet to come. Let us scrape the ice from our frosted feet, and see what sort of a place this "Spouter" may be.